For more than a year, there have been numerous reports of chemical weapons attacks in Syria. This includes reported incidents which occurred in late March, as thousands of Syrians fled the city of Idlib in the face of a government-rebel stand-off. According to witnesses, chemical weapons were used. These allegations come on the heels of a year’s worth of similar incidents in which rebel and government forces stand accused of using industrial chemicals such as chlorine against civilians and troops alike. A recent report has found with a “high degree of confidence” that chlorine attacks took place in three Syrian villages in the summer of 2014. A UN Human Rights Council Inquiry into Syria also found that there were “reasonable grounds” to believe that government helicopters carried out chemical attacks during this period. The international response has been superficially demonstrative. At the beginning of March 2015, almost a year after those attacks, the UN Security Council finally adopted a resolution that condemns the use of chlorine as a weapon. Steps such as these are to be welcomed for reaffirming the abhorrence of these weapons and the importance of the international prohibition against them. But resolutions do not imply immediate action. The use of chlorine as a weapon in Syria goes on – and there is so far little evidence that the world’s major powers have the wherewithal to bring those responsible to justice. The Syrian people have fallen victim to astounding international inertia and impotence. Until a viable alternative to the Assad regime emerges, its leader will remain in place, propped up by international allies who have their own strategic interests in Syria and who are desperate to avoid a repeat of the chaos in Libya following NATO intervention. Still, one of the few key areas of practical agreement between the US, Russia and Syria’s neighbours in the Middle East has been the need to take existing chemical weapons stockpiles out of the Syrian equation. After a diplomatic intervention by Vladimir Putin, this culminated in the destruction at sea of a large volume of chemical weapon agents and precursor chemicals. At the same time, Syria acceded to an impressive watchdog regime imposed by the Organisation for Prohibition of Chemical Weapons (OPCW), designed to ensure that states are not developing chemical weapons, as well as to oversee the destruction of any pre-existing stockpiles. Neutered? The Organisation for the Prohibition of Chemical Weapons. These were rare triumphs for international diplomacy and weapons control, but they depended more on an overlap of strategic interests than a shared sense of moral outrage at chemical weapons per se. Indeed, in May 2014, China and Russia vetoed a Security Council resolution that would have referred Syria to the International Criminal Court – the only route through which an international legally binding investigation can be launched. (Authors note; the more specific term ‘ICC criminal prosecution’ rather than ‘legally binding investigation’ should have been used here. This is because the latter term is too vague, and could be understood to refer to a number of different mechanisms which are not formally part of prosecution processes. This includes the investigation mechanism available to the UN Secretary-General for example). That veto came despite the huge volumes of evidence pointing towards the culpability of the Assad regime for a host of war crimes, which has been steadily compiled and released by NGOs, security services and the UN Commission of Inquiry. Indeed, there have even been attempts to block the UN Security Council from formally receiving evidence. Iran, for example, recently tried to stop the communication of findings from a fact-finding OPCW mission in Syria. 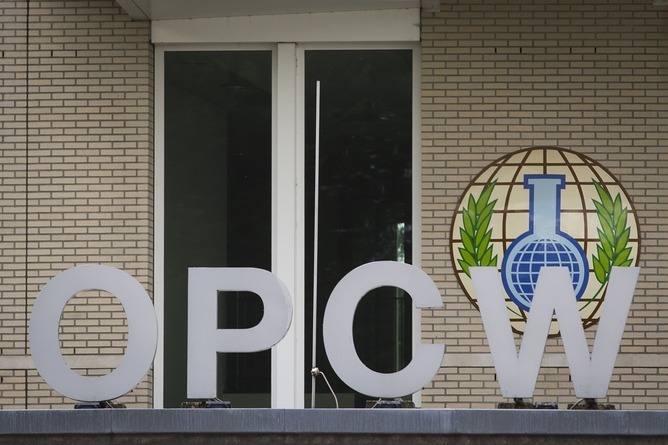 It is also very unlikely that anything approaching explicit attribution will be dealt with in any ongoing or future OPCW investigations into Syria, as long as current political realities prevail. While there is scope for discussing the source of chemical weapons attacks under the chemical weapons treaty, pursuing this too tenaciously risks politicising the gathering of evidence – and that in turn could damage the whole global weapons control regime. This delicate balance means that Assad and those responsible for the use of chemicals by his forces will only be held accountable following regime change. That time is bound to come eventually, but when this will happen is anyone’s guess. In the mean time, those who want to see the Assad regime face justice are still trying to find ways around the veto on the ICC referral, with calls for a special ad hoc tribunal similar to the one constructed for the former Yugoslavia. Advocates for that approach hope that Russia and the Assad regime could be persuaded to agree to one, since tribunals typically prosecute a wider range of suspects. This is because, they argue, that larger ad hoc tribunals make the prosecution of both government and opposition forces more likely. In March 2015, the UN Commission of Inquiry also started circulating the details of suspects to national level prosecutors. National level prosecution could potentially play a role in dealing with those who flee the country following the fall of the Assad regime (as well as foreign fighters returning to home countries). However, it is unlikely that all states will be given the list of names and equally it is likely that some states will provide refuge for certain suspects. In the meantime, continued geopolitical wrangling over Syria leaves those documenting the continuation of war crimes there almost completely powerless to stop what is happening. For now, the best we can hope for is that relevant organisations are allowed to continue to gather evidence for future trials – and that pressure is put on all states to prosecute suspected perpetrators. This is to ensure that those who are committing such atrocities know that they will eventually be held to account.